Mannipaaya? Will you please forgive me? I had promised all of you in a previous post that that I would write a post comparing the Tamil song Mannipayya with its Hindi counterpart Sharminda Hoon. Because of my busy schedule and because of all the books I have brought, I could not find much time to share all those thought with you via a blog post. I cannot, however, stop myself from sharing this song with you. This is the first time ever that I am sharing a YouTube video on The Blog of Reflections. I am in love with this song and I am sure you will love it too if you are in love, or were in love at some point. I hope language won’t be a big barrier. I don’t know Tamil too, still I enjoyed the song. Everything is perfect, Thamarai’s words, A. R. Rahman’s music, Shreya’s voice, the 2000-year-old poetry of Thiruvalluvar in chorus, and oh how can I forget it, the picturization. I’m loving it. For the curious ones (like me), here is a translation (external link). This is a long due post. I had been contemplating writing this for many days, but the list of songs grew too much to accommodate in a single post. I had also thought about writing a separate post about qawwalis of A. R. Rahman, mainly the trio: Piya Haji Ali from Fiza, Khwaja Mere Khwaja from Jodha Akbar, and Kun Faya Kun from Rockstar. I could not complete that project too. Then, I wanted to dedicate a post to Mann Mohana from Jodha Akbar; again I couldn’t do it. Finally, here I am with this post, and I have decided to base this post only on three songs, three different genres, three different religions, dedicated to that one Almighty. I usually don’t prefer plugging my earphones in while I am riding a bike. But as I was coming back from a Sunday-evening ride, and as I was in a not-so-sad mood, I plugged them in, adjusted the volume, and set the player on random shuffle. It took me about 25 minutes to come back home; what my player played in those 25 minutes was a beautiful musical ride! It was a wide range of music and poetry from the 13th century Amir Khurso, to the beautiful poetry by Gulzar in the 1960s and early 1970s, to the ultra-modern melody of A. R. Rahman. I had no choice to select what my player is playing, just out of what I had in it, it was a beautifully random mixture of a broad musical spectrum. I had five songs in those 25 minutes. The first one was Naa Jiya laage naa.. from movie Anand. It’s a beautiful song penned by Gulzar, sung by Lata Mangeshkar. I had got this song in my cell as one of the bunch of Gulzar songs I had downloaded. It is based on some classical Raaga (and I understand nothing of Indian classical music). Wonderful song, silent, melodious, treat to listen. As always, great lyrics by Gulzar: Jeena bhule the kahaan yaad nahii, thuj ko payaa hai jahaa saans phir aayi wahi (Don’t know where had I forgotten my life; I got my breath back where I found you); and blame me for poor translation. The next one, this song always make me move with from very first beat. 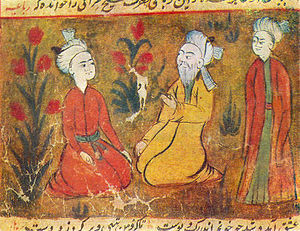 Zihal e miskin makun taghaful was an experimental poem by a 13th century Indian scholar Amir Khurso. Amir Khusro is one of the most important figure in the cultural history of medieval India. He is widely known as a pioneer of Urdu language and Urdu poetry as such. Zihal e miskin is a bilingual poem, first line inPersian the second one in Hindavi/Urdu and such goes on. With an air of Sufi mysticism, this poem revolves around love — may be love with the Almighty or with a beloved one. Zihal e miskin is particularly famous in the subcontinent and is composed and sung multiple by a wide variety of singers from Mukesh to Abida Parveen to Nusrat Fateh Ali Khan and so on. I have the Abida Parveen version. Her powerful voice and the mighty percussion of dholak won’t let you without moving. The fourth song, title song of Tamil film Alaiypauthey (2001), composed by A. R. Rahman (ARR) in Carnatic Classical music. I don’t know the language. I don’t know what lyrics Varaimuthu has written for this song (otherwise, he is excellent. See Enge enathu kavithai). This is kind of a devotional song (I don’t know, Sirish had told me; he’s native Tamil). But this song is really treat to listen. Just you need good earphones, and this can be one of the best songs to make you feel serene. And the steady buzz of tambora in the background is awesome. A must listen if you love light melody! The fifth and the last one was again an A. R. Rahman composition. Boondon se baate (talking to raindrops) from Takshak. Frankly, I had never listened this song in my cell, though I had it for long. Still, without doubt, wonderful composition as usual by ARR, and beautiful lyrics by Mehboob. Sung my some unknown-to-me female singer, this song is no less beautiful from the above four. Such was a marvelous musical ride, stretching over the period of around 800 years, from Sufi Qawwali to Indian classical to Carnatic classical to modern guitar beats; Persian, Hindi, Urdu, Tamil; exploring a wide spectrum of the subcontinental music. Two out of five Gulzar songs, two out of five ARR compositions, two out of five devotional songs (if we count zihal e miskin as devotional; and still I am a proud atheist; really no one loves the God as an atheist does). So thus was my playlist for this Sunday evening. I can’t imagine of a more bizarrely varied playlist than this one. I know I am a bit odd in my musical taste (not less than my literary taste), but still if you love anyone of these songs, please let me know. I bet we can have a good friendship with each other. If you haven’t listened anyone of them (and probability of this to happen is too much on a higher side), please get then, and I again bet you won’t be disappointed. And the poem found: Kandukondain Kandukondain!!! Eureka Eureka!!! When the crescent comes out, the heart will jump in joy thinking that the moon has arrived! By seeing the shadow, my heart will reach its ecstasy thinking that’s you!! And then comes Chitra, in her eternal voice, Enge enathu kavithai… where is my poetry?? Did it dilute in the eye? Did the dawn masquerade it? Search for my poetry or bring back my dream!! The one I wrote and folded in my dream! The mind searches for the lost face in the cervices of evenings and the intricate lanes in itself. The flower is losing its freshness by ambulating through molten tar-filled city roads in heats. The mind filters and searches for you even in the gap between two rain drops. The mind searches for its lost lover with great sorrow…even in broken bubbles!! If I see your beautiful face just once, I will be contempt with silence! I will be born a hundred times!! It wants and wishes for that warmth given by your breath while kissing…everyday!! My mind is yearning for a day when your sweat-filled shirt would embrace me! The cheek longs for the pleasurable pricking of your ‘stubbled’ face..! But you have emerged in my heart like a plant that roots itself in the cracks of a rock…!!! But you have emerged in my heart like a plant that roots itself in the cracks of a rock!!! Can it be any better…in a film song?? Looking forward for your thoughts!! And now I cannot wait! It’s just a couple of minutes since I published my last post where I said I am downloading Enge Enathu Kavithai. I just was watching the video, fortunately subtitled! I loved the lyrics of the song, but I had never watched it on screen, and could never get line-to-line meaning, but as I was watching it with subtitles, the lyrics were amazing!! I have read lyrics of both the songs Enge enathu kavithai and Evano oruvan vasikiran in translation, and though Evano oruvan has superb music (even better than Enge enathu kavithai) and an excellent poetry, the lyrics and poetry of Enge enathu is excellently touching. This song is from a Tamil movie Kandukondain Kandukondain (I have found it, or say Eureka Eureka). Featuring Tabu and Aishwarya, this movie is based on Jane Austen’s Sense and Sensibility. Where is my poem, which was recited in the dream? Has it got melted by eyes? Was It erased by dawn? Search and give me back my poem! Or else redeem my dream! My heart is in search of the face which was missed in the evening. This flower is withering love in the sun. My melting heart is in search of you even in the bursting bubbles! I will be peaceful if I see your handsome face. I will die hundred times. My heart is craving for your single glance and word! I am craving for your kiss that will leave me breathless. I want to smell you sweating clothes. It’s wishing for a cheek with a few hairs to prick. It seems a bit incomplete here, and I have an mp3 version, which goes further a few lines with a proper ending, but as far as the scene goes, and the subtitles, that is it I could have, but overall excellent poetry, and almost surprisingly fresh for film songs!! If you must ask me what I am doing at this ghostly hour on my pc (It’s 4:10 a.m. IST), I would say I am just enjoying the freedom of not needing to go office this morning (or rather tomorrow as it’s still “tonight” for me and the feeling of dawn is not here yet). I wanted to test my YouTube downloader and this is the best time to do so because of free uncongested network. I have downloaded a 7:10 minute record video of unbelievable Danger Dave, and Enge enathu kavithai (as I love the lyrics by Varaimuthu and Sirish has told me about the beautiful picturization of the song with Aishwarya on screen), and I am again going to download another Varaimuthu/Rahman song Evano oruvan vasikiran, again as I love the lyrics. Just checked my mail to see a comment on my Marathi blog. It was not on the latest post that I wrote last evening (or earlier tonight), but on a previous post. ; but the post fetched about 40 visits since it’s published. I have two options now, to go sleep or to go on a morning walk, after so many days, at 5 o’clock! I would love going on a walk; I guess it’s not raining out! But I’m awake since 3 a.m. and not sure if I can get rest in the day tomorrow. Shall I try to get some sleep? And next, What else? I’m writing this post for you! !